For any company looking to spin up some kind of operation in a new region, one of the first steps may be finding contractors in the area that can actually get the work started — but, especially as companies drift further from cities, that can increasingly become a nightmare that’s quite familiar to Matt Velker. That led to he and his co-founder starting Emptor, a network to connect companies with local contractors in order to get those local projects off the ground effectively. That can range from actual construction to janitorial work or landscaping. A platform like Emptor seeks to take a lot of the ambiguity or guesswork out of finding a set of local companies to work with in order to get construction projects off the ground. It also adds a robust audit trail — ratings or otherwise — to ensure that the best contractors surface up and that everyone knows which ones they should skip. Companies first go to Emptor and describe the projects they want and what kinds of pricing structure they are offering. Then, kind of like Thumbtack or other marketplaces, Emptor matches those projects up with qualified contractors and then compares those bids in order to select the best offer. It aims to be a replacement for the time spent searching around Yelp or Google, where there may be listings and pages but not a high volume of ratings — or ones that are even accurate to begin. Even after the search, getting the whole process started can take weeks, another period Emptor hopes to shrink by streamlining that process. 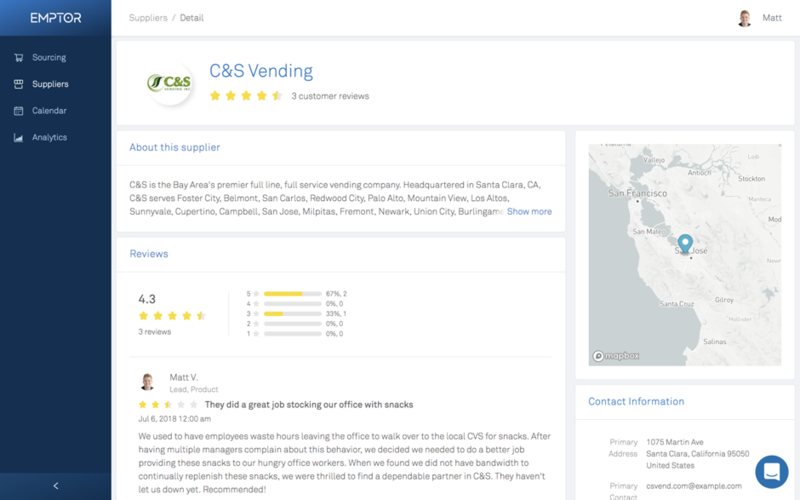 Right now Emptor mainly focuses on facilities and maintenance, though should something like this take off it could add other elements of contract work that companies need. The approach also aims to be more granular, giving companies more ways to identify the needs of the project that might not necessarily just be quantitative. After all, better data about a company’s actual needs that flows into some algorithm can produce better matching, and that can also go down to the actual way compensation would work on that project. But while it’s an attempt to try to bridge that gap between the company and a service provider, it’s one that many companies have tried to fill before. There are tools like Angie’s List and others for finding contractors, though Velker says those are primarily geared toward consumers — and some end up bending the apps in order to fill the needs they have for contractors without some kind of formal platform to use. Velker acknowledges the theory behind all these tools is pretty similar, though he hopes Emptor will be able to tackle the specific needs companies might have that he’s experienced himself.